Played a fun game of Pulp City over this last weekend. I used the undead super hero "Supreme Zed" in a squad with Chimp Chi (A samurai sword wielding chimp) and Tangent who is an expert with a brace of pistols which can buff the rest of the team if she uses her boosting abilities. 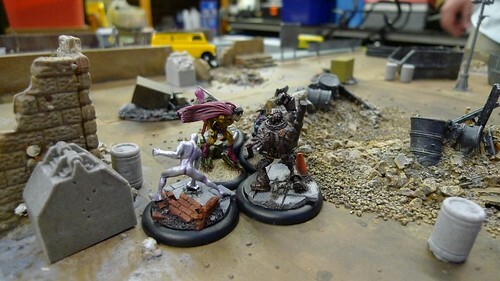 Pulp City is free to download and you can have a great game with just 3 figures a side. The turn sequence is based on using a pool of action points which allow you to use the various super powers in the team and move them around the board. There are some very colorful actions including a move Supreme Zed can complete from flying where he crashes into the ground, damaging himself and all those around him in a 3 inch radius. It certainly sparks the imagination whilst playing as you visualize the various moves which can be combined with throwing cars and other items of scenery depending on the strength of the super. Thanks Doc, it is a great game, although during my last session I rolled 5 consecutive 1's followed by a 2, then rolled 4 consecutive 4's. I had the devils luck..